This slow narrow gauge train puffs its way from Belgrave metropolitan railway station through fern forests to Gembrook deep into the hills. Puffing Billy is very popular with little kids who like to hang their legs out the side of the train. Others may be happy enough just to see the train go by. 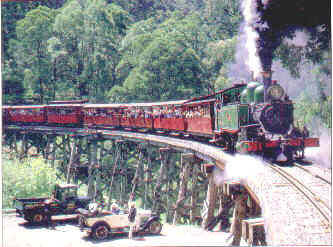 The best place to see the train is as it crosses the wooden tressle bridge shortly after it leaves Belgrave Station. From Belgrave, Puffing Billy takes one hour to Emerald Lake and 90 minutes to Gembrook. Melbourne Zoo owns the Healsville Sanctuary and an open range zoo at Werribee west of Melbourne. A pass to all three costs $33/$18/$24. See Melbourne Zoo for more deatail on the other zoos. At the top of Mount Dandenong the observatory lookout, cafe and restaurant overlook Melbourne. The city buildings can be seen far in the distance. The car park has a $2 entry fee. It you prefer just park 100 metres back down the road for free and walk in. Olinda is a small pretty town in the Dandenongs with lots of cafes and art and craft shops. It attracts lots of sightseers from Melbourne but has lost none of its small town charm. Olinda has a Rhododendron Garden. Entry fee applies. The Cuckoo restaurant just out of town is Bavarian and is full of character. Singers and musicians perform traditional German folk music over meals. All the staff wear traditional Bavarian costumes. Half day bus tours are available to the Dandenongs from Melbourne. Full day bus tours also include the Yarra Valley and its wineries. 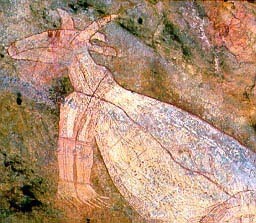 Australian Pacific Tours 184 Swanston St Melbourne full day tour departs 9am returning 5.30pm. Cost $79 ($64 if a YHA backpacker). Hotel/Hostel pickup generally available. Their half day tour departs at 1.30pm returning at 5.30pm. Cost $41 ($34 if a YHA backpacker). Cuckoo restaurant just outside Olinda is full of Bavarian character from the German food to the traditional German music and singing performed to the traditional dress of all the staff. Even the building is Bavarian. Either drive or take an organised tour from Melbourne. Local transport is infrequent. Mount Dandenong is 50 kilometres east of Melbourne. A number of roads from Melbourne climb Mount Dandenong. Catch the Belgrave Line to Belgrave and connect to Puffy Billy. Not having a car is however limiting as you cannot see the sights away from the railway line. Alternatively take an organised bus tour (see Organised Tours above). Yarra Valley and its wineries. Copyright (c) 2000 Graham Warren. Backpackers Guide to Australia is a trademark.